Food historians tell us prehistoric peoples most likely consumed fungi and mushrooms. These foods were easy to forage and incorporate into meals. The Ancient Romans appreciated the taste and grew mushrooms. Modern cultivation commenced around the 16th century. Truffles, from the Perigord region in France are considered some of the most delicate and expensive specimens of this particular type of food. Portobello and Cremini are relative newcomers. Mushrooms are a subset of the larger plant world of fungus. "Fungus in the scientific sense, means any group of simple plants which include mushrooms and similar plants, yeasts, moulds, and the rusts which grow as parasites on crops. Unlike more advanced plants, fungi lack chlorophyll and so can only grown as sprophytes (from dead plants or animals); or as parasites (on living plants); or in a mycorrhizal relationship (symbiosis between fungi and the roots of trees)...The importance of fungi for human food is not limited to those which are eaten as such, or are visible. Many which are microorganisms play an important part in making or processing human food. Yeasts are an obvious example, and are regarded as beneficent because of their role in, for example, the making of bread dough...'Musrhooms', to use the term loosely as applying to edible fungi in general, are far better known as food in the northern than in the southern hemisphere." "Mushrooms and other large varieties of fungus have geen eaten since earliest times, as traces of puffballs in the prehistoric lake dwellings of Switzerland, Germany, and Austria show; but not by everyone and not everywhere. The rarest and finest mushrooms, such as the truffle and the oronge, were highly esteemed in classical Greece and Rome, and have always been expensive...some mushrooms have been successfully cultivated for a long time. In classical times both Greeks and Romans grew the small Agrocybe aegerita...on slices of a poplar trunk. The Chinese and Japanese may have been growing chitake on rotting logs for even longer. Modern European cultivation goes back to 1600, when the French agriculturist Olivier de Serres suggested a method in his work Le Theatre d'agriculture des champs. In 1678 another Frenchman, the botanist Marchant, demonstrated to the Academie des Sciences how mushrooms could be sown in a controlled way by transplanting their mycelia (filaments whcih spread through the soil underneath them like fine roots)." "Fungi have been associated with humans since prehistoric times and must have been collected and eaten along with other plants by hunter-gatherers prior to the deveolpment of agriculture...Although their prehistoric use remains uncertain, they may have been employed as food, in the preparation of beverages, and as medicine. There is, however, no specific evidence for the use of fungi prior to the Neolithic period, when fungi consumption would have been associated with the drinking of mead (yeast-fermented diluted honey) and yeast-fermented beer or wine, and, somewhat later, the eating of yeast-fermented (leavened) bread." "The first evidence that mushrooms were used as human food in prehistoric Europe is the recent find of a bowl of field mushrooms in a Bronze Age house near Nola in Italy. Mushrooms were gathered from the wild. Classical Greek authors tend to treat them as famine food, on the level with acorns. By Romans, however, they were so highly regarded that the Stoic writer Seneca gave up mushrooms (boleti) as unnecessary luxuries---an approach to the vegetarianism and asceticism that he toyed with. Recipes are suggested by Diphilus of Siphnos, in the third century BC, and in Apicius in the fourth century AD." Why are they called "mushrooms?" "The word mushroom, first recorded in the early fifteenth century, was borrowed from Old French mousseron. This has been traced back to a late Latin mussirio, a word of unknown origin." About mushrooms in America "...it may seem surprosing that mushrooms entered the American culinary limelight only in the late nineteenth century. Until the 1890s, most mushroom recipes were for ketchups, sauces, and pickles, with occasional stewed mushooms or French-influenced dishes named "champignons." Few Americans included mushrooms in kitchen gardens, which was undertandable given Hannah Glasse's rare and unappetizing instructions for mushroom cultivation...mushroom gathering was fraught with danger, for no reliable American guides distinguished between gustatory pleasure and peril. Typical is The Kentucky Housewife (1839) by Lettice Bryan, which simply warns the cook to "be careful to select the esculent mushrooms, as some of them are very poisonous." Mushroom cultivation began in seventeeth-century France...The techniques were perfected in the 1870s and spread abroad, just as French cookery became fashionable in America. By the 1890s, a veritable fungus frenzy was sweeping America, bot as a fad food and as a scientific curiousity. Mushrooming clubs, were forager swapped tips, spring up quickly. Meticulously illustrated literature educated amateurs and professionals in identifying and cooking mushrooms...The first professional information on mushroom cultivation in America was disseminated on a large scale in the 1890s, mainly through the efforts of William Falconer." In skillet, melt butter over medium heat. Add onions and pepper, cook about 12 to 15 minutes, stirring occasionally, until tender. Add chicken broth and Worcestershire sauce. Cook another 5 to 7 minutes, until liquid has reduced. Set aside. Lightly brush mushrooms with olive oil and sprinkle salt. Place mushrooms caps face down in a baking dish. Add sauteed onions to cavity, sprinkle mozzarella cheese over top. Bake for 10 to 15 mintues on 350 degrees. Then turn broiler on and broil for 2 to 3 minutes, until cheese slightly turn brown. Garnish with parsley. Enjoy! Lots of fungi info that I didn't know, but I do know how much I love them with onion and cheese. Nicely done!!! I love mushrooms! Great filling, looks wonderful! I love stuffed mushrooms! Sadly, honey bunny is not a fan. So...I order them at restaurants instead of making them! Thanks! well if I could eat onions and not allergic this may be the one I would try looks amazing! Sorry to hear you are allergic to onions. My boyfriend doesn't like mushrooms either, but the rest of the family loves mushrooms. So I cook the mushrooms when he is not home, or I cook the mushrooms for us and cook him something else. Great Post Christine, thank you for the info! I LLoove mushrooms and caramelized onions! Love the simplicity of these ingredients. I love stuffed mushrooms and your recipe sounds just delicious. Love this recipe, Christine. It sounds delicious. 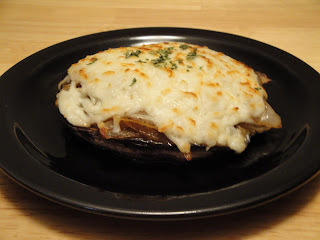 Portabella mushroom is my favorite,sound really yummy,great post !! Sounds wonderful - we love mushrooms and onions (okay, my son is most decidedly NOT a fan of either, but the rest of us love them). Great looking recipe! It seems that both onions and mushrooms are magic foods, indeed, for their digestive qualities as well as their flavor and taste. You sold me with the blanket of mozzarella covering the mushroom. Buzzed! Mushrooms aren't exactly my favorite thing, but with all that good stuff inside and that wonderful cheese on top, I'd be happy to eat this! Great post Christine! After centuries of being used in the other parts of the world, it is not surprising that it had to take a "fad" to get them used in the U.S. ;) You did a great job celebrating this delicious food! great info!! great recipe I love the stuffing!! We love stuffed portabella mushrooms...actually any stuffed mushrooms. Yours looks really good...now I'm hungry! Mmmmmmm....this would make a delicious dinner! Love the gobs of melted cheese on top! about common interests, or link with other members as professionals.